PARADIGMS & PARADOXES CONSULTANTS was formally organized February 8, 1997. On their first year, their very first clients were Asea Brown Boveri (Basic & Advanced Train the Trainors and Presentation Skills Workshops), VCP Trading International (Strategic Planning and Teambuilding), Westco Electrical & Equipment Corporation (Strategic Planning & Values & Attitude), Electro Concepts Engineering (Supervisory Program, Teambuilding and Values & Attitudes), Bank of Commerce (Basic and Advanced Train the Trainors, Time Management and Leadership Development), Bank of the Philippine Islands (Customer Relations and Leadership Empowerment Training Programs), Department of Trade & Industry (Presentation Skills) and AFP Retirement and Separation Benefits Services (Written Business Communication). In the same year, P&PC invited a respected trainor from Malaysia and organized a public seminar entitled “Putting Magic Into Training” which drew a big number of participants. P&PC also successfully marketed Dr. Palan’s book with the same title. It was, indeed, an auspicious beginning for an organization of purposive and indefatigable human resource and organization development professionals composed of the founder, Ms. Moje Ramos-Aquino, and her four full time training associates plus five senior program consultants. The four pioneers, Mssrs. Miel Abdon, Rhod Nuncio, Zoilo Lopez and Howard Borromeo were former students of Ms. Ramos-Aquino at San Beda College (B.S. Philosophy and Human Resources Management) and later joined by Ms. Karen Castro from the College of Holy Spirit. Being fresh graduates, they worked as they trained systematically under the patient guidance of Ms. Ramos-Aquino. They were later joined by three others plus two or three Bedan on-the-job trainees during the summer breaks. Likewise, in 1997 and to this day, P&PC was designated by the American Society for Training & Development as its accredited Philippines Delegation Organizer for its annual International Conferences held every month of May-June at select convention cities of the USA. Ms. Ramos-Aquino continues to make P&PC shine and known as she speaks at various international conferences on HRD in Malaysia, USA, Indonesia, South Africa, Tunisia, Australia and Singapore. 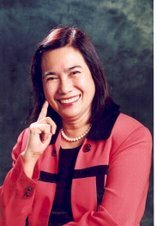 She is an active member of the Personnel Management Association of the Philippines as chairman of the Publications Committee in 1999 and 2000 (awarded most outstanding committee for 1999). While the first clients have become regulars, still new companies were added to their network of clients even if there was no conscious effort to market their program. They grow their business by getting repeat business from all their clients. Their only marketing technique is word of endorsement from their satisfied clients. P&PC count among their steady clients government, private business and non-government organizations in various fields and industries. Among them are: Hayakawa Electronics, Midas Kapiti International, Pro-Life Philippines, WeServe International, Aboitiz Transport & Consumer Group, WG&A Philippines, Focus Global, Boehringer Ingelheim (Phils. ), AMA Group of Companies, Malayan Insurance Company, Star Cinema Production, Adamson University (Engineering Department), MacroAsia Eurest, Max’s Ermita, The Boots Company, First Philippine Holdings, Lopez Inc., Adtel, Club Estancia, Department of Tourism, Personnel Management Association of the Philippines, Sterling Tobacco Corporation, Caritas Manila, Philippine Association of National Advertisers, Warner Home Video, Yasaki-Torres Manufacturing, Unilab Liturgical Council, Ports Network Corporation of Manila, Aichi Forging Company of Asia,Philippine Daily Inquirer, MSF Tire & Rubber Company, Clark Development Corporation and others. Their newest satisfied clients are Landbank of the Philippines, First Asia Institute of Technology & the Humanities, National Electrification Administration, INA Research Philippines, and International Rice Research Institute. Among the favorite programs of their clients are: Corporate Planning (Strategic, Operational and Action Planning), Communications (Written Business Communication, Effective Presentation Skills, Technical Report Writing, The Art of Conversation, Effective Telephone Communication), Team Building, Excellent Customer Relations, Trainer Development (Basic, Advanced, Training Evaluation), Personality Development, Stress Management, Entrepreneurship, Supervisory & Leadership Programs and Values & Attitudes among others. They, also, have the capability for Organization Diagnosis, Executive Position Evaluation and Compensation Structure, Job Profiling, Job Evaluation and Salary Study, Performance Management System, Company Newsletter, Learning Needs Analysis, Climate Survey and other human resource and organization programs and systems. Slowly and deliberately, P&PC built up their own resources. They design and produce their own program materials and handouts. They boast of a decent library with more than 1,500 books, periodicals and looseleaf materials. They have the requisite high-tech equipment such as desktop PCs, notebook, scanner, printer, and combo binder. All these are housed at 4715 Ang Buhay Street, Sta. Mesa, Manila, Philippines. Their telephone/fax numbers are (+63-2) 715-9332 and 714-4533. Their e-mail addresses are moje@mydestiny.net and paradigms@mydestiny.net. Their address in cyberspace is http://www.learningandinnovation.com/. They were not without their own critical moments. Ms. Ramos-Aquino went through the discovery-surgery-healing phases of cancer starting mid-1998. With the Asian economic crisis and her illness, she was forced to cut her loses by letting go of her associates. With their competencies in training and consulting, they immediately gained employment as professors in various universities. They never really left. To this day, they hangout at the office and actively help out whenever they can. Three years in chaotic clime, P&PC has emerged as a winner, not just a survivor. Indeed they live true to their mission: “We are a learning organization helping others become learning organizations.” Though profitability is desired as a business result; what gives them most satisfaction and props them up in both critical and opportune times is their ability to make a difference by helping others identify and realize their talents and potentials in a fun way.